Get in the holiday spirit with this New York City Christmas tour with a private guide. Check out the iconic tree in Rockefeller Center, revel in the colorful lights and classic decorations. See the famous window displays at top department stores and enjoy a meal at a restaurant in Times Square. This private tour of New York City at Christmastime begins with a pickup at your hotel or other preferred place. Since it’s a private tour you can pick your pickup point within NYC. 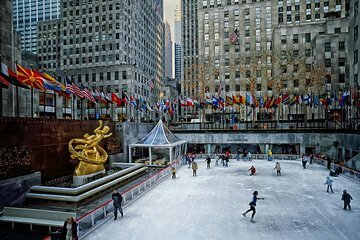 Along your way, see some of the best decorated places, including the department store displays on Fifth Avenue, the Radio City Music Hall, and the famous Christmas tree at Rockefeller Center. Plus, visit the holiday markets at Bryant Park. Continue on, and stop in Times Square for a 2-course dinner or lunch, depending on when your tour began. Your tour ends at the Hard Rock Cafe in Times Square. Please note there is an upgrade option if you'd like to opt for it which includes a Statue of Liberty walking tour, too.